Graydon Cramer is currently the band director for Brandon West Middle Schools at Waverly Park School in Brandon, Manitoba. He completed his B. Mus/B. Ed at Brandon University where he studied with Greg Gatien and Ben Reimer and is a highly sought after drummer, clinician, and music educator. Graydon has toured and played many concerts and festivals throughout Western Canada with the likes of the Winnipeg Jazz Collective, Jeff Presslaff, Chameleon, Anagram, Dean McNeil, the Saskatoon and Winnipeg Jazz Orchestras, and the NuPhunk Orchestra. 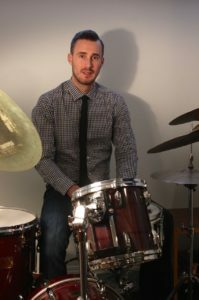 Graydon is a long standing faculty member as the Jazz drum set instructor at the International Music Camp and maintains a private teaching studio in addition to serving as an adjudicator, clinician, and conductor for various workshops, festivals, and honour bands throughout Manitoba.